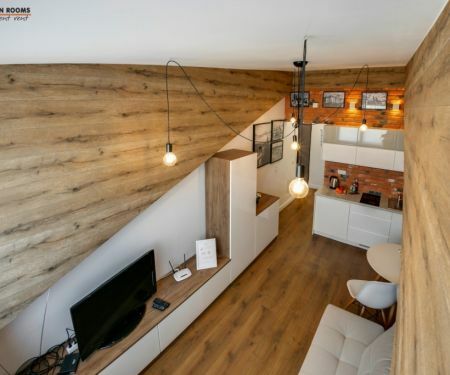 For rent a luxurious, spacious apartment just by the Vistula Boulevards in Krakow, close to Oskar Schindler's Enamel Factory and MOCAK - Museum of Contemporary Art. 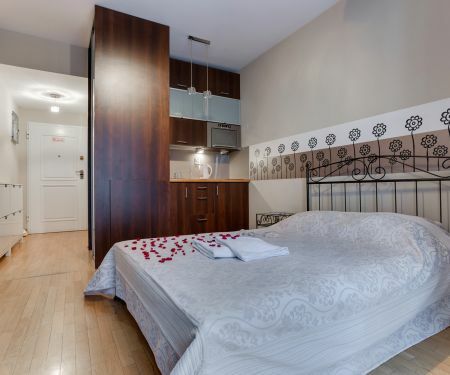 The apartment, put into use in 2019, consists of a living room with a kitchenette and a bathroom equipped with a walk-in shower. The apartment is equipped with every comfort: TV, work desk, oven and washing machine. The optimal amount of space for two people. Apartment near the former Miraculum factory, which thanks to planners becomes a post-industrial, artistic district of Krakow. Zabłocie is one of the most fashionable and best-developed parts of Krakow - there is the Museum of Enamel Oskar Schindler's Factory, MOCAK - Museum of Contemporary Art, Cracow Academy of Art. Frycza Modrzewskiego and Zabłocie Business Park. Jestem pasjonatka dobrej kuchni, podrozy i jazdy konnej. Z Krakowem jestem zwiazana od urodzenia. Apartment in a buidling from 2018 near the former Miraculum factory, which thanks to planners becomes a post-industrial, artistic district of Krakow. Zabłocie is one of the most fashionable and best-developed parts of Krakow - the Enamel Oskar Schindler's Factory Museum and MOCAK - Museum of Contemporary Art are nearby.